Topcroft parish lies in south-east Norfolk south of theB1135 in a maze of lanes to the north-west of the Waveney valley. The settlement is one with a dispersed nature lacking a clearly defined centre but straggling over acres of good-quality arable land. Farming has always been the raison d'etre for life in this region of Norfolk and the occupations of the parishioners clearly show the bias towards the land. 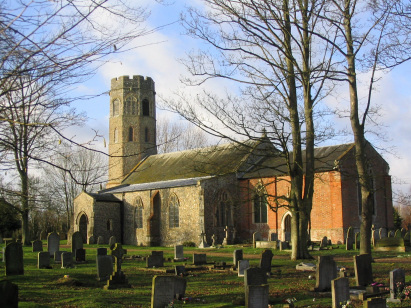 St Margarets church lies to the north of the main area of the village and has an attractive tree-overhung approach opening out into a spacious churchyard. 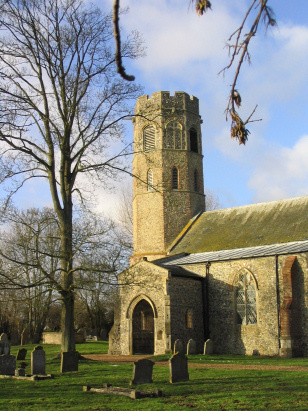 The round tower is indicative of an early foundation and probably dates from the late 11th century, the rest of the church is typical Norfolk Perpendicular of the 14th century but which must restoration from 1876. These records were transcribed from microfiche 5 & 6 of the collection of the Norfolk Record Office. These fiche represent a fairly old filming and there are times when the contrast could be improved. In the main the entries are perfectly readable with care. Subject to the ususal caveat regarding the standard of the clerk's writing - which on occasion was less than obvious - it is to be hoped few errors will have crept into the compilation of this transcript.